Just like the parent of a kid growing up from an infant to a toddler, my experience with New Horizons in flight – since our launch two years ago this week – is that the first two years have passed amazingly quickly and yet amazingly slowly, all at the same time. I guess that given some of the spacecraft hiccups of the past several months, one could also analogize that New Horizons has reached the “Terrible Two” stage and is into saying “no” a little more these days than in its first year. 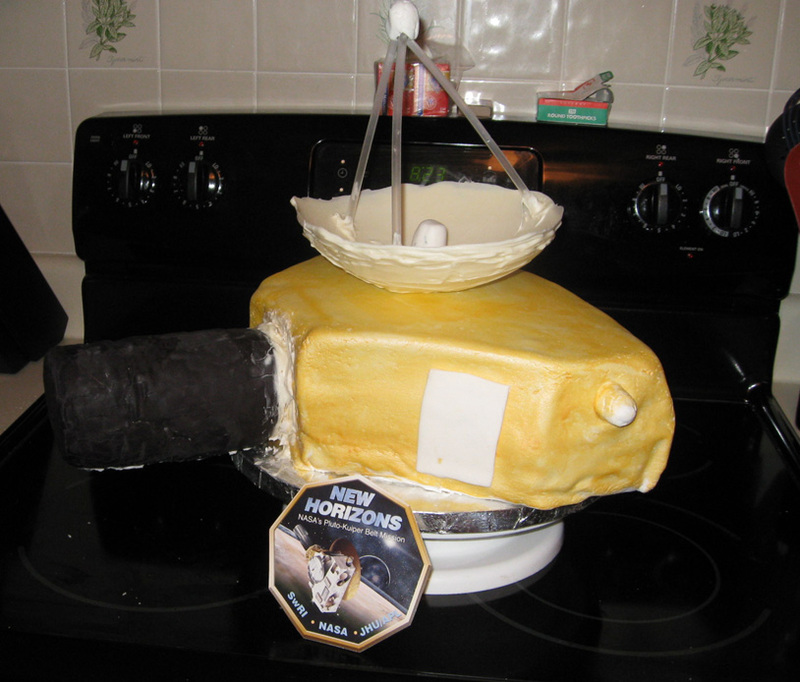 New Horizons celebrates the completion of its second year in flight this Saturday, January 19. 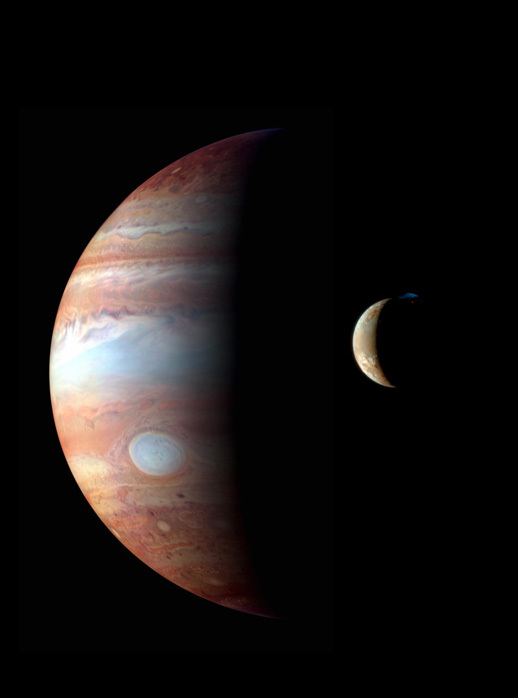 This montage of giant Jupiter and its volcanic moon Io, replete with the spectacular Tvashtar polar plume, was assembled from New Horizons imagery. As you can see by visiting our Where Is New Horizons, we are now nearing a distance of 9 Astronomical Units from the Sun and speeding onward. This time next year, we’ll already be almost halfway between 12 and 13 AU! Our spacecraft will be in quiet cruise or hibernation for most of 2008. Short wakeups will occur in May and December to re-point our high-gain antenna toward Earth and conduct other maintenance activities. Also on our flight plan is our second active checkout, which will fill the period from September through early November with many kinds of spacecraft and instrument activities. But otherwise we plan for things to be very quiet on orbit this year. And we have already determined from tracking data that our trajectory correction maneuver in late September was so accurate that no clean-up burn will be required in 2008 (nor will such be very likely in 2009, either). The major work of New Horizons in 2008 will be on the ground. 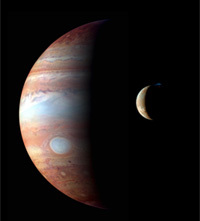 One activity will be the creation, testing and uploading of new spacecraft software with various bug fixes and performance improvements that derived from our Jupiter encounter and second-year flight experiences. Another large activity will be designing and building the entire Pluto near-encounter sequence, which we will also prepare for test on our spacecraft simulator, “NHOPS,” next year. In addition to these two activities and routine flight operations in cruise and annual checkout, we also expect to commission NHOPS-2, our newly minted backup spacecraft simulator. In the meantime, though, we’ve savoring the successful second year of flight the project has had. 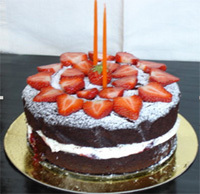 And the homemade cake to the right (made by APL’s Simmie Berman) is evidence of that! Well, that catches you up with where New Horizons is and what the spacecraft and project team have been doing. I’ll be back with more news in March. In the meantime, keep on exploring, just like we do!